Bellis or Daisy is recognised by it’s flat rosettes of oval leaves and small white yellow eyed flowers. They tend to form colonies that hug the ground to smother out nearby grass. From the boots of the ‘My old mans a dustman’ song, ‘it takes such a job to pull them up that he calls them daisy roots’ the best treatment is a selective weed killer that may need a couple of applications. Alternatively each root can be dug out by hand. Dandelion leaves are recognised by long hairless coarsely toothed leaves that form large rosettes. They form dense mat to suppress the nearby plants or grass. The flowers are bright yellow and self-seed freely from Dandelion clocks the globular seed heads we blew as children. The long tap root will regrow unless removed completely or killed by systemic weed killer. Spot treat the weed with a touchweeder or selectively apply a weed killer. Burning and boiling water on the leaves may have some impact on crazy paving but i don’t find it works on lawns. Buttercups stunt nearby plants and make the lawn look uncared for. 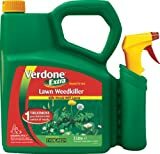 remove by hand or normal weed killers. Clover has shamrock shaped leaves (not real rocks as you find in rockeries). Clover stays green in drought and as a leguminous plant its roots provide nitrogen for grass but the pink or white flowers are intrusive. As clover thrives on poor soil feed the lawn and use a grass box on the mower to remove seed heads. Lawn sand may be used to treat the problem. Plantains have large leaf rosettes that can smother grass and compete for vital nutrients. Fork out by hand or treat individually. Annual meadow grass hosts harmful eelworms and is hard to control with weed killers. The leaves are short tufts and strap shaped with tiny coarse flowers. in summer they can die back leaving patches. Feed the lawn well and use the grass bow when mowing. really bad investations may need re sowing or turfing. A regular mowing by a machine with sharp blades is the best defence. Grubbing out tools with long handles are available from garden centres. A daisy grubber will have two prongs or a a narrow bulb planter mat suffice. ‘Speedy Weed’ has 3 prongs and is twisted to remove dandelions. 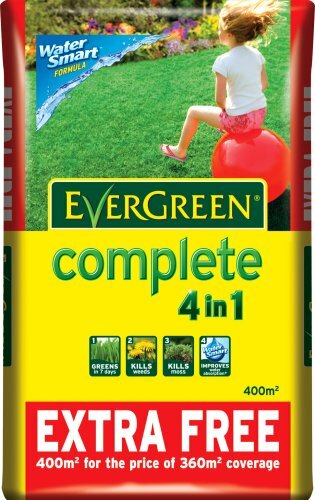 Lawn weed killer – Four in One Weed killer and Feed. Feeds grass, kills weeds, controls moss and helps protect against draught.